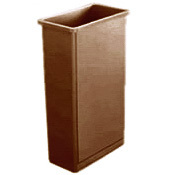 Rubbermaid® Slim Jim® Recycling Container, Brown, 23 gal..
Home » Waste Disposal » Waste Containers » Rubbermaid® Slim Jim® Recycling Container, Brown, 23 gal.. Efficient size and shape fits tight spaces. Durable construction is easy to clean and provides long life.